When Updetails.com visited the Tokyo Motor Show 2017, we were introduced to the figure of the hydrogen engined concept bus. Yes, the bus is a Toyota Sora that is prepared for soon ware-wiri for the sake of serving and supporting the 2020 Olympics in Tokyo. 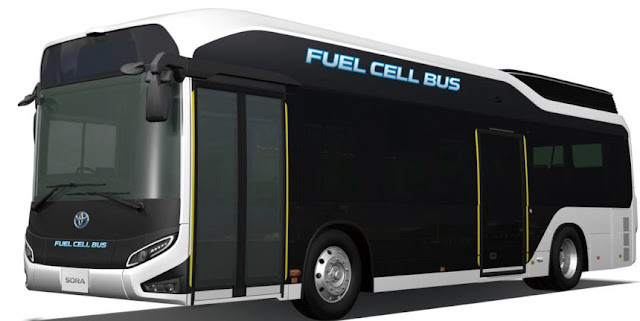 Bus technology similar to Toyota Mirai has officially started production and sales in Japan. Since this bus and can be expected to make public transportation, it means will be produced in large quantities dong? Well, about that, Toyota already said that they will only distribute about 100 units of Sora just for the Tokyo area. Of course for the sake of the Olympics. This bus has a length of 10.5 meters and can accommodate 79 people, consisting of 22 people sitting, 56 people standing and 1 person bus driver. 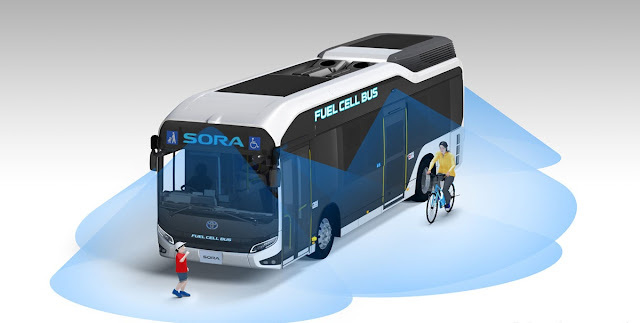 Toyota Sora uses two stacks of hydrogen fuel cell aka Fuel Cell Stacks, each of which has a magnitude of 114 kW. They are ready to deliver electrical power for both AC-type electric motors that are synchronous, aka sync with each other and the power is 113 kW for each motor. Toyota Sora also has a small drive battery unit that relies on NiMH batteries are classified as old school. Toyota Sora has 10 hydrogen tanks with a combined capacity of 600 liters, with a pressure of about 70 Mpa. Toyota claims, the total mileage is not inferior to the usual diesel bus. Sora also has an interesting emergency feature, which is an external power supply. Thus, there is a special inverter connected to the vehicle through CHAdeMO, which is capable of providing up to 9 kW of additional power. Actually, the external power supply can provide power up to 235 kWh, but it depends on usage only. 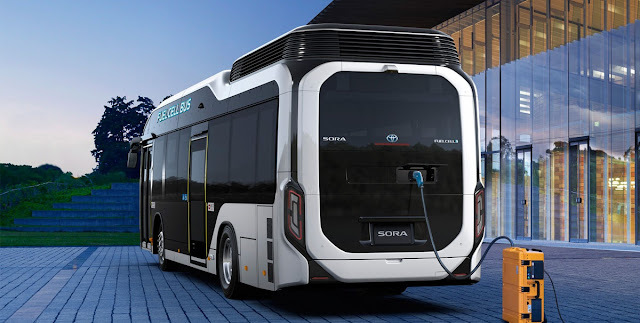 Although it sounds like the idea of ​​a foreign-foreign hydrogen bus is very much for a country of Japanese caliber, Toyota itself has not commented about Sora's plan to become a regular bus. Well, if in Indonesia, may be the electric car brand Mobil Anak Bangsa (MAB) we ever discussed can imitate the steps of Toyota. 0 Response to "Toyota Sora Hydrogen Bus Starts Producing, Preparing For the 2020 Olympics"